How’s winter been treating you? Here in Pennsylvania, it’s been so strange. One day it’s 60 degrees and the next it’s in the 20’s – 30’s! This weekend is my youngest son’s 21st birthday. That makes me feel so old – but I’m young at heart! The family has been planning a snowboarding outing to celebrate, but with temps to be in the mid 50’s this weekend, I don’t think that is gonna happen! Winter really isn’t my favorite season, but we haven’t had much snow yet and it’s always nice to have at least one good snowfall! Despite the strange weather, I’ve been bringing some cozy, wintery touches into my home. Today I’m sharing my winter entry and a new Welcome sign that is available to purchase in my Etsy shop. 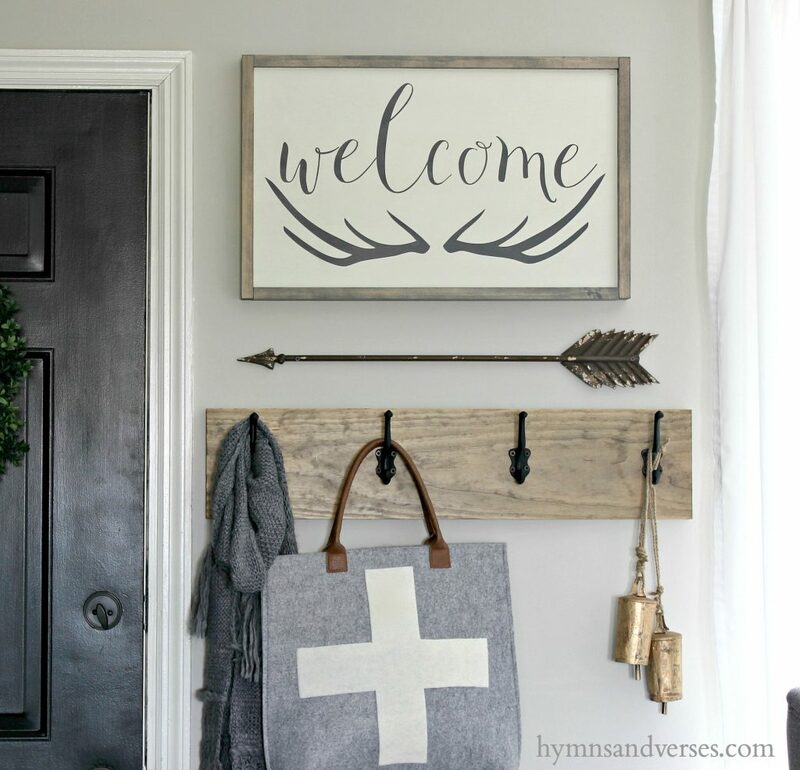 The “Welcome” sign features a fun antler motif and makes it perfect for the fall and winter seasons. 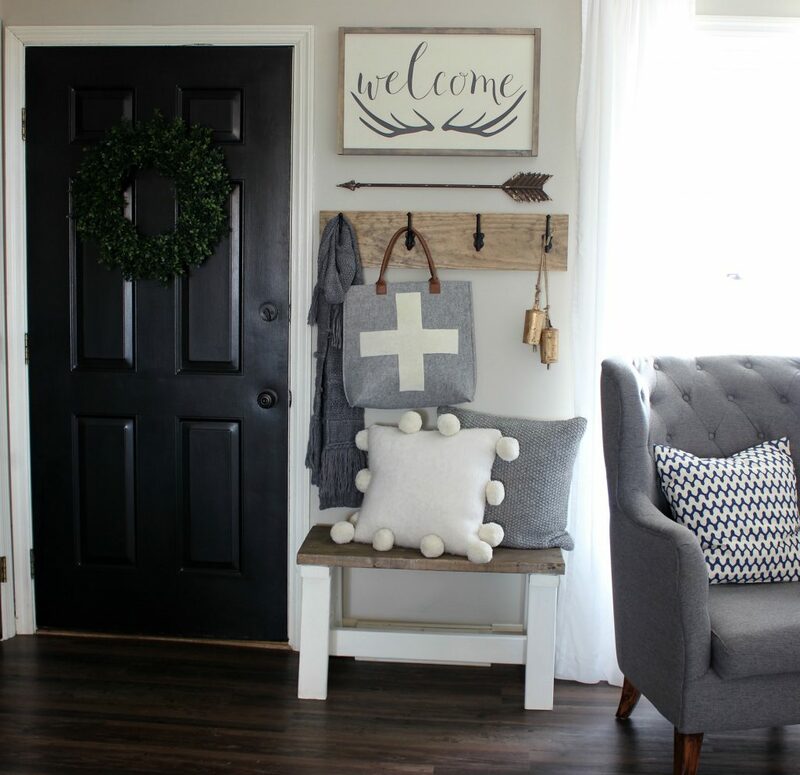 But, with antlers being so popular in farmhouse decor, it could be used in any season! 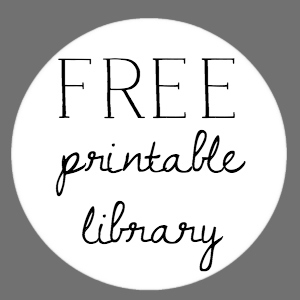 The sign measures 16″ x 25 1/2″ (the perfect size for an entryway. The background is painted a linen shade and the lettering is a charcoal gray. The frame was finished with gray stain. All of the signs in my shop are solid wood and are hand painted. The ledge from the frame makes the signs easy to hang. The wool swiss cross tote is a DIY that I just finished. I’ll be sharing that with you soon. I can’t wait to share the rest of my living with you – hopefully later this week. I’ll include sources at the bottom of this post for the items shown in the photos! Thanks so much for stopping by for a visit today! I’ll be back soon with a tutorial for the wool swiss cross tote! I’ve been waiting for this to come to your shop since I saw it last fall! Will be ordering soon. Take care Doreen. Thanks so much, Suzanne! So glad you like it! It looks awesome! I’ll be checking out your shop soon! Loving all of this!! I just adore your style of decorating Doreen!! I absolutely love all of your designs and decorating. I was noticing your black interior doors. I have always wanted to paint my interior doors black, too. So my question is, when you chose to paint them, did you paint the front and back, and if so, did you paint doors in the bedroom to match the room door, like the closet door. Thank you for any advice you can give. I’ll be sharing a post soon about my painted doors. I did paint both sides of the doors, except the front door. My front door exterior is Benjamin Moore Mill Springs Blue. 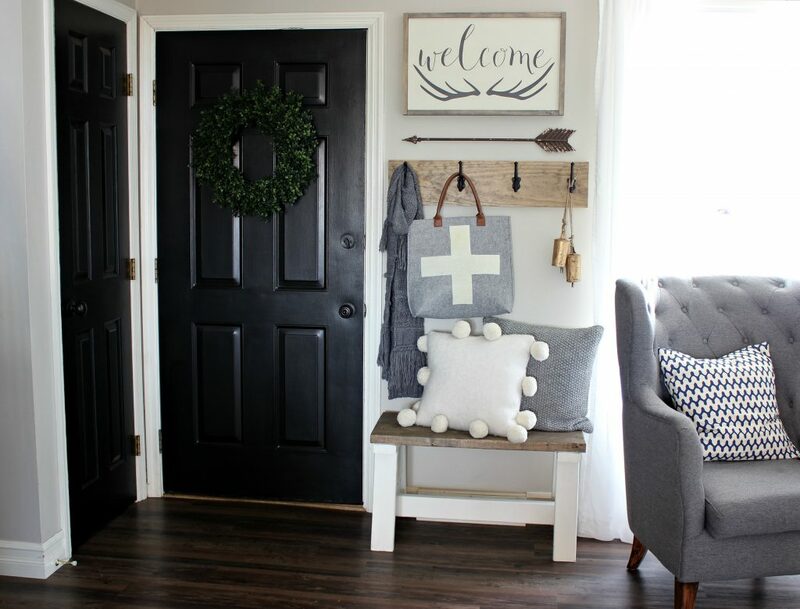 Such a cute entry way! Great sign! 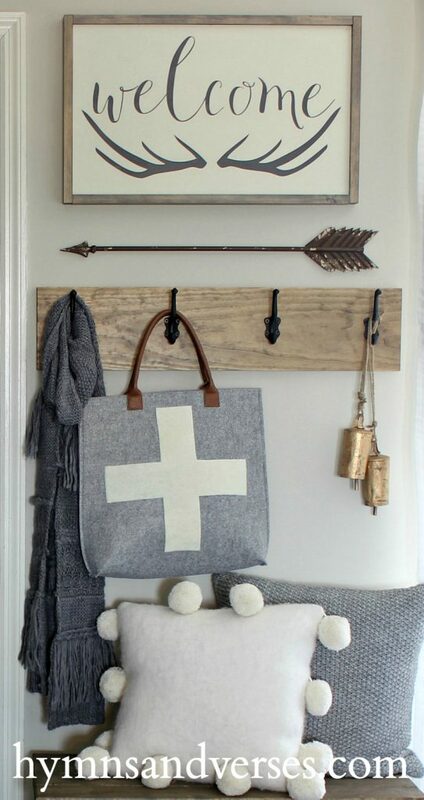 Love your little entryway. Wonderful for a small space. Are there plans for the bench? It is just the right size. 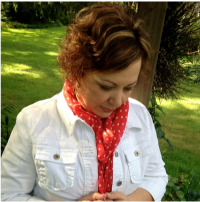 Thank you for your wonderful inspiring posts. I would love to know how you made your bench. It is exactly what I am looking for in my entryway!!!! 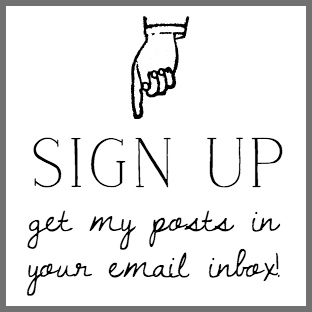 Do you have a DIY blog on it?? Hi! The welcome antlers sign says not available. Is this sign discontinued? I can make the sign for you. I’ll add it to my Etsy shop now! Thanks for asking!